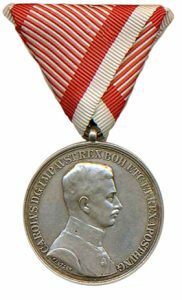 In this blog I am commencing a discussion of the Bravery Medal (Tapferkeitsmedaille) that was issued in 1917 with the image of Emperor Karl on the obverse. In the next blog I publish I will complete my discussion of this decoration. Thus this is part I of a two part discussion on this decoration. The Bravery Medal as a decoration had existed since it was first established by Joseph II in 1789. 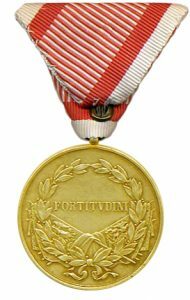 The first decorations issued specifically for bravery were called an Honor Decorations (Ehrenzeichen) until 1809 when the next decoration in the series was re-named as the Bravery Medal (Tapferkeitsmedaille). In addition to the medal issued in 1789 versions of this medal designated as Honor Medals were issued in 1792 by Franz II and 1804 by Franz I. Versions designated as Bravery Medals were issued prior to 1917 in 1809 by Franz I and in 1839 by Ferdinand I. In 1849 it was reissued by Franz Joseph to assure that it was consistent with the other awards that bore his image during this phase of his reign. He further modified the bravery medal in 1859 and would again in 1866 and for a final time in 1915. Subsequent to his death the medal was once again modified to conform to the requirements of the new emperor. In this blog I am going to discuss the enlisted bravery medal as issued from 1917-1922 during Karl’s reign. In subsequent blogs I will discuss the Part II of the description of this decoration and the final version of the bravery medal, the officer bravery medal, that was the last type of this historic award which had been issued from 1789-1922. Reason Issued: All medals were issued to reward bravery by non-commissioned officers and enlisted men in the face of an armed enemy. All classes of the bravery medal could be worn at the same time. Officers who had won the medal as non-commissioned officers or enlisted men were allowed to continue wearing the medal when they became an officer. The Non-commissioned officer most decorated with this award was Feldpilot Offizierstellvertreter Julius Arigi. He was awarded the Golden Bravery Medal four times, The Silver Bravery Medal 1st class four times and both the Silver Bravery Medal 2nd class and the Bronze Bravery Medal two times. There were 18 persons awarded the Gold Bravery Medal twice and six persons awarded the Gold Bravery Medal three times. Among the three time winners were the Austro-Hungarian flyers Eugen Bonsch, Stefen Fejes and Freidrich Hefty. There were at least two female recipients of the Bravery Medal, second class. They were Officer Aspirant Helene Stepaniwna and Feldwebel-Kadettaspiarant Sophie Haleczka. Recipients of the Gold Bravery Medal were to be transferred from the front to protect them. Design: A round medal with a spherical ball shaped eye for the gold medal and silver medal 1st class and a wedge shaped eye for the silver medal 2nd class and the bronze medal. Figure 2: Karl Silver Bravery Medal, first class, obverse. Image from the author’s archive. Obverse: A bust of the Emperor Karl facing right in a marshals uniform with the Order of the Golden Fleece and the grand cordon of the Order of Maria Theresia. Above the bust is inscribed: CAROLVS D.G .IMP AVST.REX BOH . ETC ET REX APOST HVNG. Below the shoulder of the bust of the emperor is the designer’s name KAUTSCH (Heinrich Kautsch). For some privately manufactured gold medals the designers name is Petzl (F. Petzl). Reverse: A Laurel Wreath tied at the bottom with a flying ribbon, the bottom of which rests on a group of four crossed flags and two standards with zig-sag lines to indicate the colors black, yellow, and red, white, green. Partially hidden by the leaves of the wreath there appears on the right foremost flag, half of the Austrian, and on the corresponding flag on the left, half the Hungarian large coat of arms of the Dual Monarchy. In the center of the field is the word “FORTITVDINI” (Bravery). Silver Bravery Medal, first class = 40 mm in diameter. Type II Silver Medal, first class: A medal as described above except it has a flat spade shaped eye. Type III Silver Medal, first class: A medal the same as Type I except it is bronze gilt. Type IV Silver Medal, first class: The same as type III except it has a wire loop eye. Type II Silver Medal, second class: A medal as described above except it has a small wedge shaped eye. Type III Silver Medal, second class: A medal the same as type I and II except it is bronze gilt. Type IV Silver Medal, second class: A medal the same as Type II except it is made of war metal. I hope you enjoyed this blog. Next time I will complete my description of the Karl Bravery Medal, 1917-1922. Until then I wish you well.